If you've read my blog for a while, you know I keep an ink journal to keep track of all my fountain pen inks. I update it every time I refill or clean a pen, so it's a great record of maintenance, and of course it helps me remember which ink is in which pen! But I also play around in it from time to time, and ink comparisons are always great fun. I had a yen a while back to compare my grey inks - or at least, the grey and blue-grey inks I had loaded in pens at the time. What you see above is a scan of that comparison. I also took a photo of the page, in natural light (indirect sunlight), and to my eyes, this one (the photo above) is a far more accurate portrayal of the colors. But some people prefer scans to photos, so in the interest of a full range, I used both imaging options. I hadn't realized, until I put them all together like this, how very greenish the Noodler's Lexington Gray is. The Registrar's Ink and the Lexington Gray are both waterproof, so they show up on postcards with some regularity. The others are for the innards of a letter or a journal. Do I have a favorite? I guess I'd have to flag the Iroshizuku Fuyu-Syogun and the Registrar's Ink as current top picks, both for the color and behavior. For those who are as geeky as I am about this sort of thing, these comparisons are in a Clairefontaine Basics clothbound journal, just like this one I blogged about over a year ago, except the current incarnation has a black cover. I'm pretty happy with using this journal as an ink journal, but when I finish this one, perhaps I'll branch out. Who knows. Awesome! This comparison will be useful to me. Love the look of the Diamine Grey! I took a liking to Diamine Graphite ink, a black-gray. Bought a 30 ml small bottle from Diamine UK directly. My ink list-to-buy just grew again :-) I like the Lexington Gray very much, but I think I'm going to get Iroshizuku Fuyu-Syogun next time I buy ink. 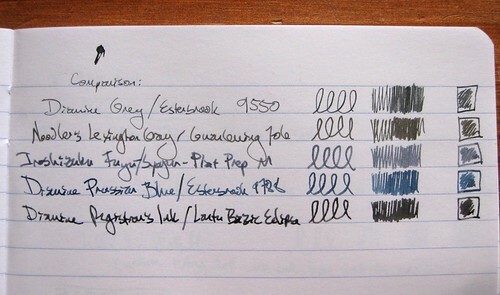 The fuyu-syogun is on my to get list :) Lexington grey is pretty much my go to grey ink right now. There's something so romantic and...nerdy (in the best way!) about an ink journal -- I love it! Brilliant idea and interesting too -- it would make a fabulous novel. I'd be interested in seeing Parker Quink black in comparison with those. It has a reputation of being grey instead of black, and I've certainly noticed that when comparing it to Sheaffer Skrip black and Lamy black. Stefan - on the one hand, any ink that calls itself black but comes out grey would probably not live long in my ink stash without being passed along to someone else. I do confess I own a bottle of Parker Quink black, but I've never opened it or loaded it in a pen - it's a vintage bottle from my grandfather which has gained some sentimental value for me especially after his death, and I haven't had the urge to crack it open. On the other hand, I've also heard folks say that Waterman Black is like a grey, and I haven't had that experience at all - it is the only ink I load in my very wet Parker 51 (which I do pamper a bit), and maybe it's the wetness of that pen, but it's nice and black in that context.